Focus on Ireland: Kidney departs, what happens next? IT CAME as no surprise that the IRFU decided against renewing Kidney’s contract. Their recent defeat in Rome, Ireland’s first Six Nations loss to Italy, left Ireland with only one win and languishing in fifth position. Had Wales started the championship as they ended it, with an impressive dismantling of England at the Millennium Stadium finale, and had France not malfunctioned then Ireland would have been the deserved recipients of a first Wooden Spoon since 1998. While it’s only natural that the head coach receives a fair share of flak when results aren’t going their teams’ way, Declan Kidney’s critics had plenty of ammunition to fire their #kidneyout campaign. There has been a steady decline in Irish win percentages since they completed a historic Grand Slam in Kidney’s first season in the top job, with only four wins since the 2011 Rugby World Cup. And his recent decision to let Jamie Heaslip retain the captaincy despite the return of O’Driscoll was a bold move, one which raised eyebrows and ultimately failed to engender a new Ireland. His choice of fly-half to deputise for the crooked Sexton also attracted its fair share of opprobrium. Having persisted with an ageing and floundering O’Gara on the bench for the opening two weekends, Kidney then handed Paddy Jackson the reigns against Scotland and for the remaining games, all the while ignoring the in-form ten in Ireland, Ian Madigan. Declan Kidney made the calls and was always likely to stick to his decisions, particularly regarding Jackson, but he never give the impression he was completely at ease with his choice. With Kidney sailing off into the sunset, speculation is already rife as to where his successor will come from, with Irish media and supporters pushing forward the early front runners. It was announced that current attack coach Les Kiss would lead Ireland on an interim basis, supported by Gert Smal and Anthony Foley, in North America. Indeed, we may not know until after that tour whether Kiss is a contender for the role long-term but his elevation has bought the IRFU time to find a suitable replacement. 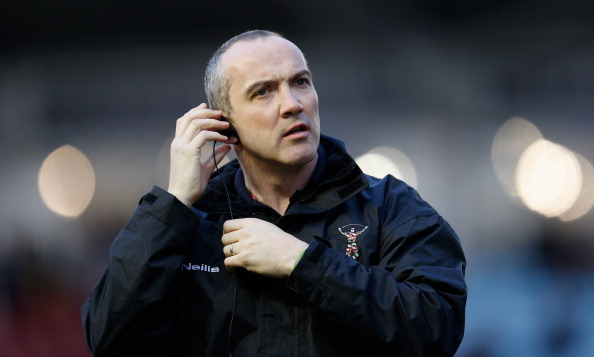 Conor O’Shea was installed as the early favourite to succeed Kidney when the Six Nations campaign derailed, but the Harlequins director of rugby has since consistently reiterated his commitment to the London club. Even if O’Shea was available, his appointment would require a change in Ireland’s coaching structure. The former London Irish fullback has accumulated his coaching experience in a directing capacity, a far cry from the hands on approach which Kidney preferred. It’s too soon to rule him out of the reckoning but for O’Shea the timing doesn’t seem to fit. The same might be said for Saracens director of rugby Mark McCall, another former Irish international making waves in the Aviva Premiership. If the IRFU prefer an Irish successor then these two will surely be at the top of the list. Both are ambitious, who would certainly bring their own ideas to the job, but doubts remain whether either candidate can be tempted away from their current roles mid-contract. 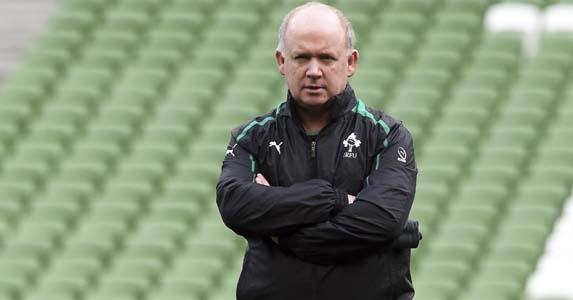 It may be that the IRFU need to look further afield in their search for Declan Kidney’s replacement, which brings in the likes of Australian Ewen McKenzie, the bookies favourite at present. The portents are promising, the former Waratahs and Stade Francais head coach has already stated his intention to leave his current post with the Queensland Reds at the end of this Super Rugby season. Fuelling this speculation is McKenzie’s stated desire to pursue international ambitions. Ireland could conceivably provide that stepping stone, and given his recent success turning around the Reds Super Rugby fortunes it may be that McKenzie has the credentials to halt the Irish slide. The spanner in the works could be whether the former prop is holding out for the Wallabies job which may become available depending how Robbie Deans fares against the Lions in the summer. Other overseas names mentioned have included Jake White, but the IRFU are unlikely to break the bank for the former World Cup winning coach and he too is said to be interested in a seemingly coveted Wallabies job. Graham Henry could be tempted as a short term solution if the IRFU aren’t looking beyond the 2015 Rugby World Cup, while Wayne Smith, a backs coach well known for an attractive running brand of rugby, would be a coup at the end of his Waikato Chiefs contract. There is a school of thought amongst Irish fans that an overseas coach with no ties to any of the provinces might be the way forward, but we’ll have to see if the IRFU are feeling progressive enough to take that risk or if they will prefer a known quantity, one they’ve already worked with – I’d wager for the latter. 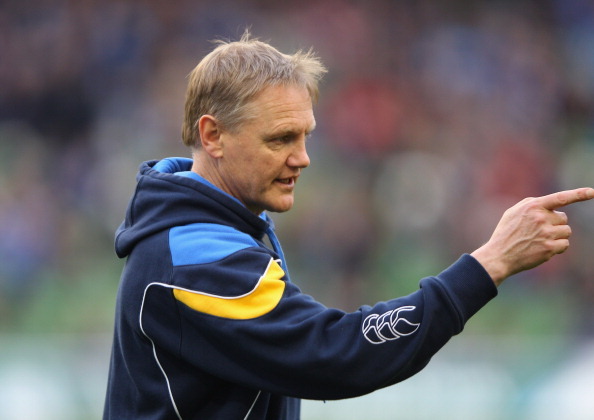 Making his point: Is Joe Schmidt ready to leave Leinster? In that is the case, Joe Schmidt, a double Heineken Cup winner with Leinster and already familiar with the ranks in the IRFU, becomes a leading contender. They could do a lot worse than to convince the Kiwi to stay in Ireland for a few more years. If Schmidt has ambitions to coach the All Blacks then the experience will hardly do those aspirations any harm. Schmidt, who also had successful spells as backs coach with Clermont Auvergne and Auckland Blues, has one year left to run on his Leinster contract but unlike O’Shea that obstacle is unlikely to deter the IRFU if they deem him the right man for the job. Alternatively the IRFU may choose to offer Mike Ruddock a path back to the top of international rugby. Let’s not forget that Ruddock was a Grand Slam winning coach with Wales. Currently in his third season leading the Irish under-20s. In a similar fashion to Stuart Lancaster with the England Saxons, Ruddock also has the advantage of having worked with many of the up and coming stars of Irish rugby, some of which have already made their mark on the international stage. The likes of Simon Zebo, Craig Gilroy, Luke Marshall, Paddy Jackson and Iain Henderson amongst others have all graduated from Ruddock’s ‘Wolfpuppies’ to full Irish internationals. And with others such Munster playmaker JJ Hanrahan, Connacht fullback Robbie Henshaw and current under-20 captain Luke McGrath all set to follow that route, Ruddock would be a considered choice on that basis alone.